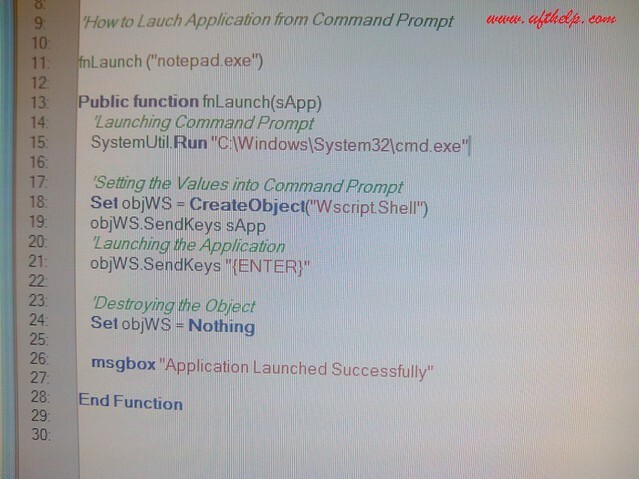 How to launch Application from Command Prompt in UFT? Scenario:- How we can launch our application to be automated from ‘Command Prompt‘ in UFT/QTP? but rather it was expecting parameters based on the Region for which we want this to be launched. To overcome this problem and coming with reusable function, we adopted an alternate approach of launching our region specific applications from ‘Command Prompt’. of launching. Here we have taken “Notepad” application for launching example. Created “Shell Script” code for sending keyboard commands. Please feel free to share your comments and experiences on this. Why we Automate Testing ? How to append zero(0) to user defined date?